Showrooming, whether retailers like it or not, is here to stay. In fact, as smartphone usage grows, it’s only going to increase. Naturally, as retailers see the threat of people using their mobiles to compare prices and buy elsewhere, they are concerned about this trend. So what should retailers do instead? Unless you want to try the approach used by the Melbourne store, and risk deterring customers altogether, the best approach is to try to use showrooming trends to your advantage. According to a consumer survey carried out for our recent How the Internet Can Save the High Street report, 43% of UK shoppers now use smartphones while on the move to compare prices and read product reviews. This figure is up from 19% in the same survey last year. Q: Have you used your mobile to compare prices and look at product reviews while out shopping? Retailers are now looking to create digital shopping ‘experiences’ which bring digital technology into stores. For example, Burberry’s flagship London store contains and impressive array of digital gadgetry to provide a better shopping experience for customers. This includes iPads by the dozen, lots of video screens, including full-length screens which convert into mirrors, as well as clothing which has been chipped to trigger catwalk videos when in near a mirror. M&S has tried something similar in its Cheshire Oaks store, adding virtual make-up counters, lots of video screens, and wi-fi. Some of the gadgetry may be beyond the budgets of many offline retailers, but tactics like adding wi-fi and using prompts for mobile users don’t have to cost a fortune. This obviously isn’t possible for every store, but if retailers’ products cannot be price-compared, then showrooming is less of a challenge. Indeed, Target has been asking suppliers to create product lines that can only be sold in stores, thus reducing the impact of showrooming. This may work for a bigger retailer with the spending power to influence suppliers, but it’s not a tatice that will work for many others. The threat posed by comparison apps and sites, and those offered by retailers like Amazon shouldn’t be underestimated. Chances are, if you have a product that Amazon also stocks, it will probably be cheaper with the online retail giant. Add to that the flexible delivery and free shipping options and it’s easy to see why it’s a threat. However, if you can point customers at your own mobile sites and apps for product research, then the Amazon effect can be reduced. If they can see product details, reviews etc then they may not feel the need to head elsewhere. If you have an app or mobile site, shout about it. Prompt people to download it in stores, add prompts to product displays, even incentivise people to download and use apps and sites with discounts and other offers. For example, users of Debenhams’s apps were encouraged to scan a QR code for a free coffee. A small thing perhaps, but it meant that customers spent more time in stores, increasing the likelihood of them making a purchase. If you can’t beat ’em, join ’em. Let mobile users access the internet with ease in your stores, in conjunction with your own app and mobile site which, of course they are prompted to access in store. This can help to attract customers to your store, and they will appreciate not having to eat into their data allowances. Indeed, recent stats from JiWire found that 44% of all age groups say that the availability of in-store wi-fi influences where they shop. There are added benefits to providing wi-fi too. You can ask customers to register and provide a few details in return for wi-fi access. I wouldn’t recommend that retailers ask for too much, but an email address and a few details aren’t unreasonable. This then opens up possibilities for location-based targeting of promotions while users are in store. Dave Wieneke provides some examples of how retailers can use preciosion marketing. Consumer reviews are powerful, and if they work online, why not use them offline? According to the same JiWire study mentioned earlier in this article, 57.3% are using wi-fi to find product reviews, which indicates they are considering a purchase and merely require some reassurance, or the social proof offered by reviews. Of course, retailers should prompt customers to check out the reviews on their own sites (and 36.5% of the JiWire respondents are using wi-fi to browse the store’s website), but there are other ways of using reviews offline. They can be offered at point of sale, as Blackberry does here with Reevoo reviews. They offer useful information for consumers and are detailed enough to allow customers to assess different product characteristics. This is perhaps a risky tactic, and one employed by Best Buy in the run up to Christmas. There were a few caveats (no obscure online retailers for one) but it’s potentially an effective tactic. The risk I mentioned is that posed to the retailer’s bottom line. Amazon’s economies of scale can be matched by very few offline or multichannel retailers, so price matching alone could just lead to a race to the bottom. However, if retailers can use this to gain repeat business, or cross-sell at the same time, it may be a useful tactic. As the online channel matures, and growth slows, customer service (and customer experience) will be the key differentiator. It can also trump price in some circumstances. For some purchases, price online will be the deciding factor once customers decide to buy a certain product, but they will also appreciate great service and the personal touch. While multichannel retailers can’t always match the likes of Amazon for price, there are many other factors that should be used to provide an advantage. Reserve and collect. This appeals to customers who like to do their research online but prefer the convenience of in-store collection. Indeed, 40% of UK shoppers used collect in store services over the Christmas period. This allows retailers the opportunity to drive customers into stores, where they may make other purchases, as well as saving them from the hassles that are sometimes associated with delivery. In-store returns. The smart online retailer will offer free and convenient returns, but many don’t, and customers will often prefer to return items to a store where they can exchange them or receive a refund faster than they could via postal returns. Appeal to the ‘want it now’ mentality. Sometimes, if you want a product, you just don’t want to wait, and offline retailers will always have this advantage over online rivals. 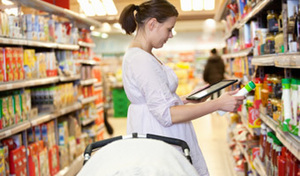 Retailers can make the most of this by offering the ability to check stock in local stores. One of the reasons in-store shoppers turn to their mobiles is to find information, so why not make sure they can find out more in-store? If staff are knowledgable enough to answer customers’ product queries effectively, then they may not need to head online. Let’s say a customer if considering buying one of two laptops. If a knowledgeable staff member can explain the differences and pros and cons of each, then they may persuade the customer to purchase there and then. However, if staff don’t have the required product knowledge, then it’s easy to find this information online, where customers may also find the same laptop at a cheaper price. If people are in your stores using their phones, why not find a way of turning this to your advantage, and getting these ‘showroomers’ to promote your store? One example of this comes from TopShop. After receiving free style and make-up sessions, shoppers were invited to create a digital “Wish You Were At Topshop” postcard using the photo-sharing app, Instagram. The shoppers’ images were captured though an iPad, set with an Instagram filter. Shoppers were then encouraged to upload and share their images on social media. QR codes (rightly) have their detractors, and implementation of QR has been patchy to say the least. 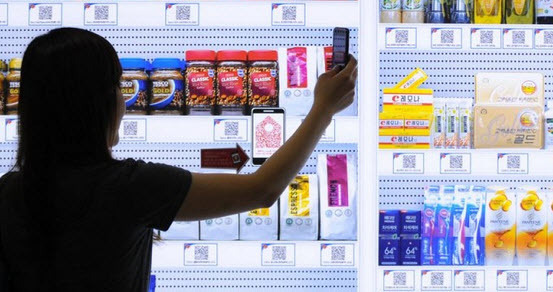 However, it can work when used well and a good place to use QR is in stores where people are seeking product information, and have some ‘dwell time’. Selfridges actually messed up on execution here, as one of the codes leads to an unoptimised landing page, not the promised video, but the idea still stands. Of course, it doesn’t have to be QR, the same could be achieved by using a barcode scanner, or simply adding a URL to the point of sale. Have I missed anything here? How else can stores appeal to mobile shoppers? Have you seen any great examples recently? Get the lowdown on the latest multichannel trends at Integrated Marketing Week in New York on June 10. I had the pleasure (or dubious honour?) of moderating on Econsultancy’s attribution analysis and modelling table at this year’s Digital Cream event at the Emirates stadium in London. It was an intriguing insight in to what ecommerce teams are doing and what is holding them back. The common theme was a slight unease about how best to use attribution modelling to help the business grow. There was variety in the type of company represented, from membership organisations to high street retailers, as well as the job roles of the people attending, from ecommerce managers to business analysts. Here’s a summary of the six key issues that were discussed and the challenges that businesses are facing. Twitter’s Vine launched to much fanfare at the beginning of the year and brands have been quick to experiment with the video sharing tool to both promote their products and generally have a bit of fun. Unfortunately too many brands seem to think that just because it’s a throwaway six-second clip they don’t have to put much effort into it, so the clips often end up looking quite messy and of poor quality. Similarly the temptation is often to try and cram as much as you can into the short time frame, which can make it difficult to work out what’s going on in the clip. In my opinion, the best examples use a single continuous clip or motion capture so the viewer doesn’t have to try and take in several different camera angles in just six seconds. I would suggest that unless there’s a particuarly pressing need, Vines should be limited to around three of four different shots otherwise it can dilute the impact. Furthermore, it’s a good idea to mount the phone on something so that the video doesn’t look too shaky. Digital is no longer just a channel, but instead is becoming the center point for customer behavior both on and offline. This is one of several themes that will be explored at Integrated Marketing Week (#IMW13) and below Shawn Burns, Vice President SAP who is speaking at the event, tells us why.